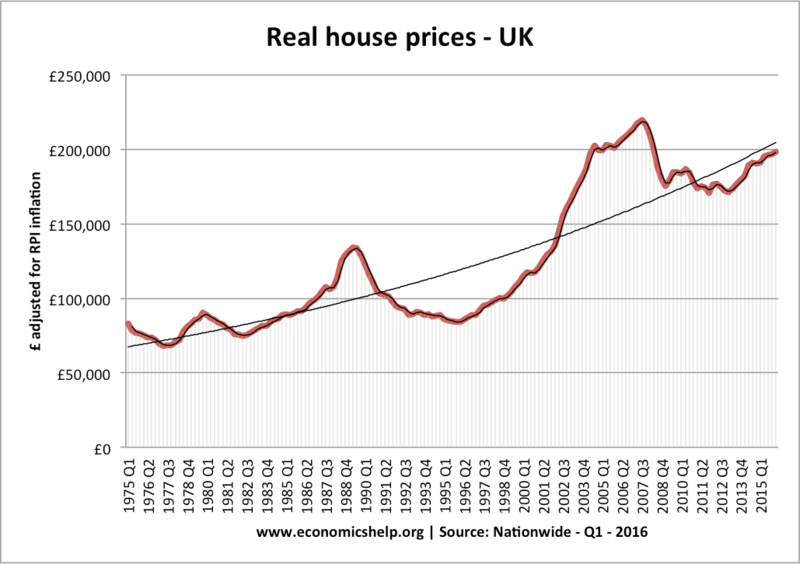 Home > Economics help blog > housing > Why are UK house prices so high? Why are UK house prices so high? In recent years, we have had a devastating global credit crunch, the longest and deepest recession since the 1930s (if not worse). Across Europe, we have seen mass unemployment and in countries like Spain, Ireland and Portugal, the housing market has seen up to 50% falls in house prices. Yet, despite this financial and economic upheaval, UK house prices have bucked the trend, avoided a major collapse and now exceeded pre-crash levels. It is true that in the first years of the credit crunch, UK house prices did fall 20%. But, the resilience of house prices in the past few years has been less expected – despite the ongoing weakness of the economy. It is perhaps too early to start panicking about another housing bubble. 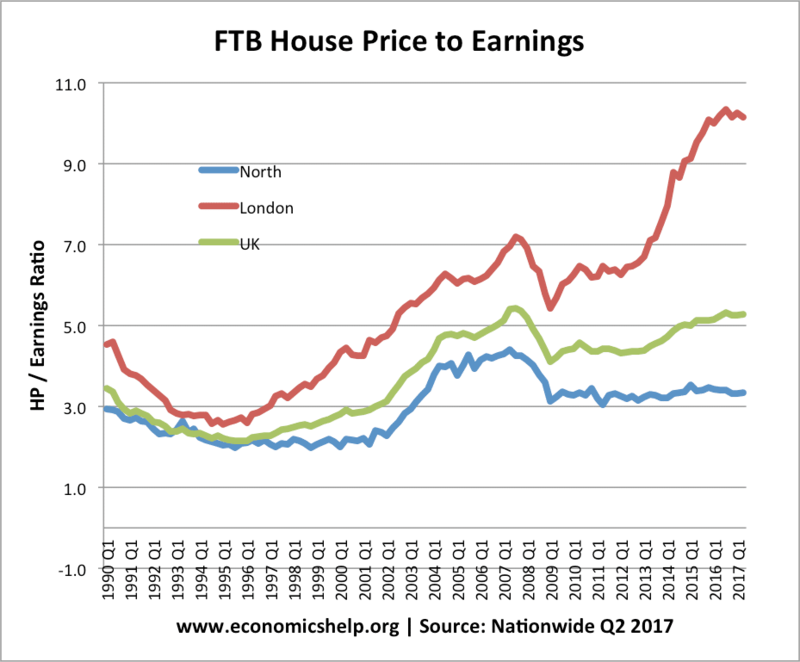 But, what thing is undeniable – UK house prices are very expensive and are close to record levels compared to earnings. According to the Nationwide, house prices are now above their 2007 peak. 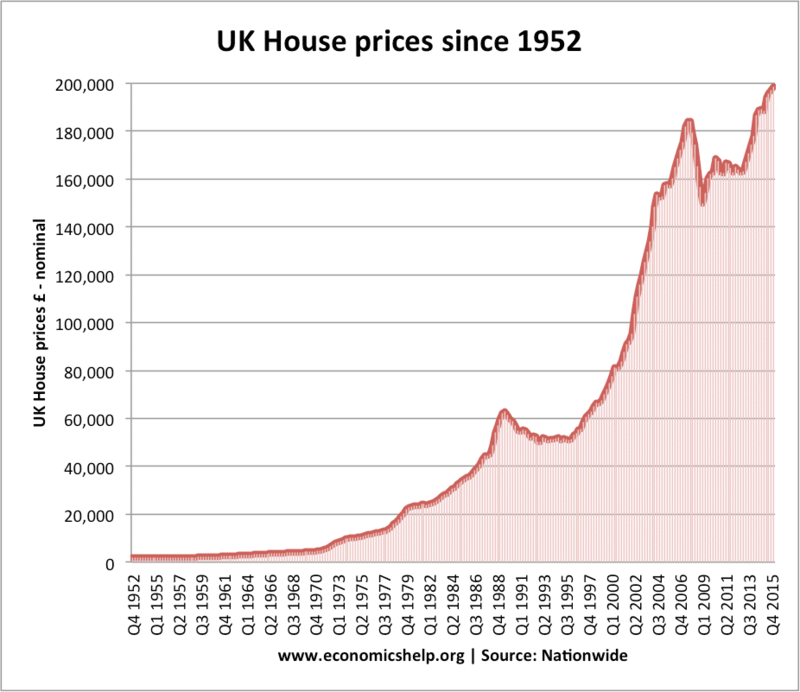 This graph shows that since the 1970s, house prices have risen significantly – even adjusted for inflation. More worryingly, the ratio of house prices to income continues to remain above long-term trends. This shows the ratio of house price to incomes for first-time buyers. House price to income ratios are almost double levels seen in the mid-1990s. It is also worth noting there is a sharp north-south divide. House price rises in London are masking falls in house prices in the north. 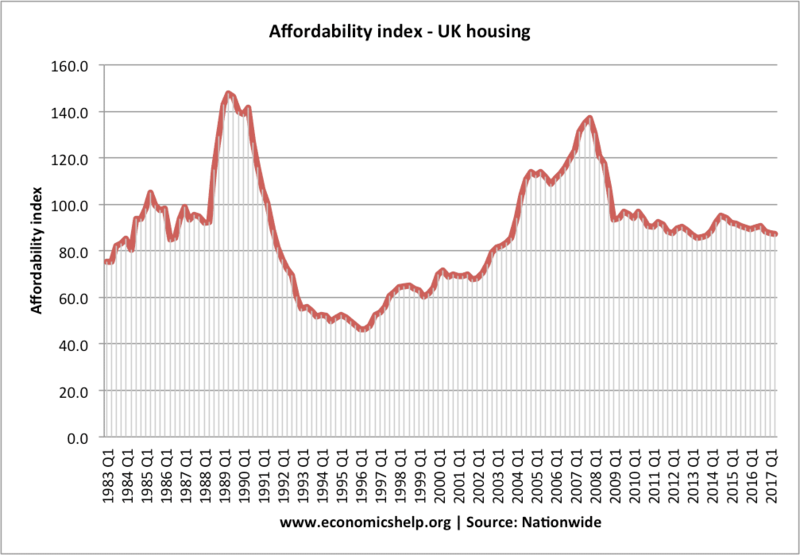 What explains the continued lack of affordability for the UK housing market? 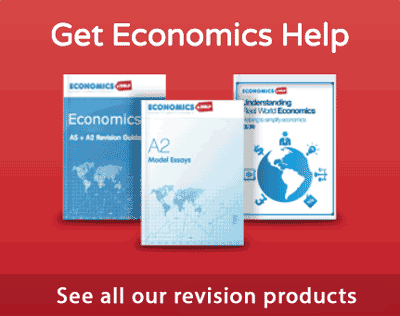 A very simple economic truth: if demand increases faster than supply then prices will rise. Despite some short-term fluctuations, demand for housing has been rising at a faster rate than the supply. The UK population continues to grow (52 million in 1960 to 63.23 million in 2012). The forecast is for 71 million by 2033. Also, the number of householdareis growing at a faster rate than the population. Demographic changes, such as higher divorce rates, and more single people living alone, have meant an increase in the number of households. Because of the growing number of households and growing demand for housing, the government estimate we need to build 250,000 new houses a year, just to keep pace. However, despite many politicians talking about the necessity of building homes, in practice, we have a reluctance/inability to build houses. House building is at its lowest level since the second world war. In 2012, only 107,000 houses were built – much less than the 250,000 the government feel is necessary to keep pace with a rising population. Environmental cost. The British have a strong attachment to preserving “greenbelt land” Many areas are protected from further housing development. Not In my back Yard. People are usually in favour of more homes being built, as long as they are not in their local area. Increasing supply of houses leads to more congestion, crowded amenities and loss of greenbelt land. Vested interests perhaps most importantly increased supply reduces the value of your existing home. Therefore, existing homeowners have a vested interest in keeping the supply as low as possible in their area. Lack of Social Housing. 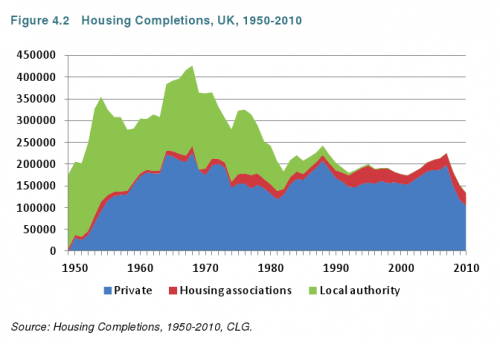 Since Mrs Thatcher encouraged the sale of council housing, the number of new social housing (a euphemism for council housing) has been very low. The consequence of this growing demand compared to limited growth in supply, is that there is a strong economic pressure on house prices. When Ireland and Spain experienced a housing boom, they also built 400,000 homes a year. When the bubble burst, there were numerous unsold properties. This excess housing stock dragged down prices. The UK never had this excess supply, which explains why prices didn’t fall as rapidly. In recent years, the % of first time buyers has fallen. The number of people able to buy a house has fallen, due to the decline in affordability. However, there is a strong cultural and economic desire to own your property. Increasingly common is for parents to help their children to buy a house, with a deposit or even putting the mortgage in their name. This has enabled first time buyers to overcome the impossible income multiples and buy despite the expensive prices. Despite the volatile nature of the housing market, housing has increasingly been seen as a good investment. The returns on buying a house have consistently outperformed the stock market. This has encouraged a new generation of buy to let investors, this has helped to increase demand further. In London, there has been a lot of demand from foreign nationals such as Russians and Arabs. Some argue this speculative increase in demand means the high house prices are unsustainable and are liable to fall. But, it also shows that the housing market is highly regional with London prices strongly outperforming other regions, especially in the north. 6. Relatively Low Interest rates. Low interest rates have definitely helped increase house prices in the short term. Low interest rates makes buying more attractive than renting. 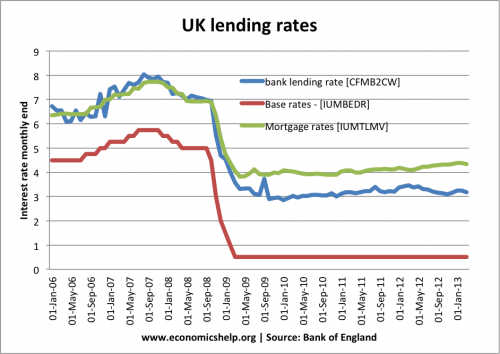 Since 1992 interest rates in the UK have fallen from 15% to 0.5%, making the cost of getting a mortgage relatively lower. This shows the affordability of mortgages – despite rising prices, low interest rates have kept buying relatively affordable. The alternative to buying a house is renting. 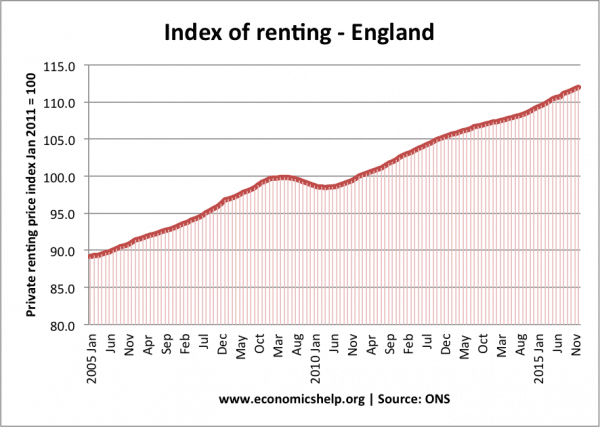 But, the cost of renting has also risen faster than incomes. If you are paying £800 a month, it makes sense to try and get a mortgage where you will be paying £900 a month, even if it means borrowing up to 6 or 7 times your income. 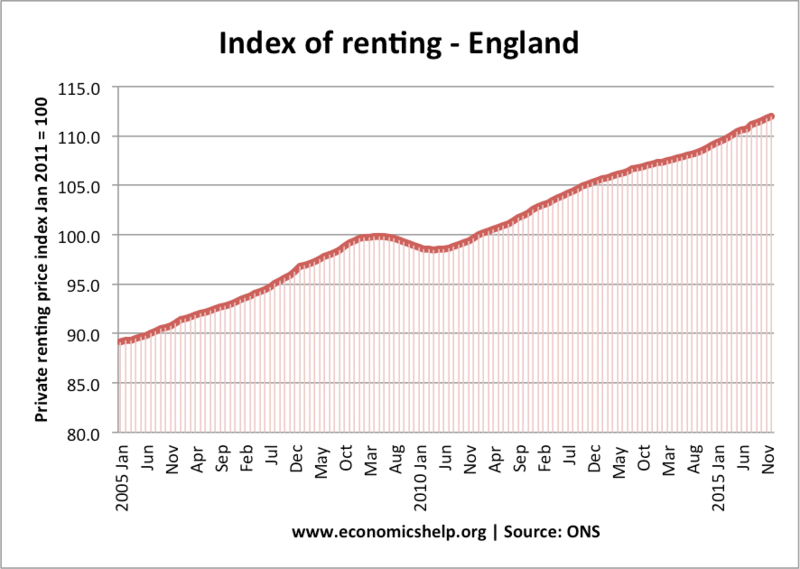 The increased price of renting reflects the fundamental imbalance in demand and supply. It is true that the price of housing is now rising faster than renting, but it still makes economic sense to buy rather than rent. This means people are increasingly looking towards unconventional mortgages to help them buy a house. The expensive nature of the UK housing market raises significant concerns such as – lack of geographical mobility, wealth and income inequality, an economy vulnerable to boom and busts in house prices. But, it doesn’t look like changing in the near future. Are rising house prices a good thing? London housing market – boom and bust? This entry was posted in housing and tagged house prices, housing. Bookmark the permalink. I’m still puzzled by the house price increases over the last 20 years or so. There is no one factor that’s obviously the explanation. What have Sweden and the UK got in common that explains the house price increase in both countries? Darned if I know. It’s ridiculously expensive to live in London and the South East, but where will new houses be built? They will be built where there is high demand, which is where there is access to well paid jobs i.e. London and the SE, since global companies want the prestige of a London postcode for their head offices. House prices are completely a function of bank lending. Housing supply is essentially fixed, even in an economy that is building houses, they take time to construct and are drip-fed by developers to maximise profit. New housing is typically built on marginal land – all the best locations are already occupied. This means that whilst you might be able to build enough houses for everyone, you can’t build a house for everyone in the most desired locations. Thus you can never satisfy demand just with new supply. If mortgage credit is in ready supply and cheap then prices will be bid up. 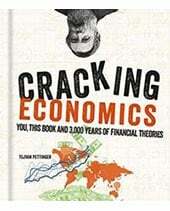 Ultimately of course credit expansion cannot go on for ever; debts needs to be serviced by wages and profits. 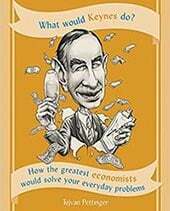 History shows us that credit expansion always outstrips the productive economy, driving booms and busts. Counter-cyclical policies need to restrict lending for property purchase and I would also propose a location value tax to control demand and encourage efficient usage of land. The revcovery stage of the housing market is definitely over. I believe the Help To Buy Scheme that was introduced in 2013 has had an impact on house prices increasing and as you pointed out a strong hold in home owner ship rather than to let properties. Bob has a good point…where are new houses going to be built? From living in the South-East there are numerous new housing developments being built with most first time buyers grasping on the government scheme to ensure ownership. 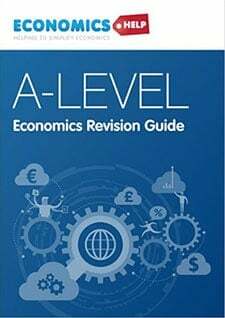 This is really informative and helpful. 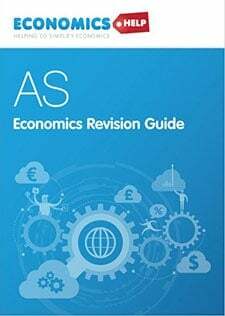 Great blog by the way and thanks for sharing this useful information.